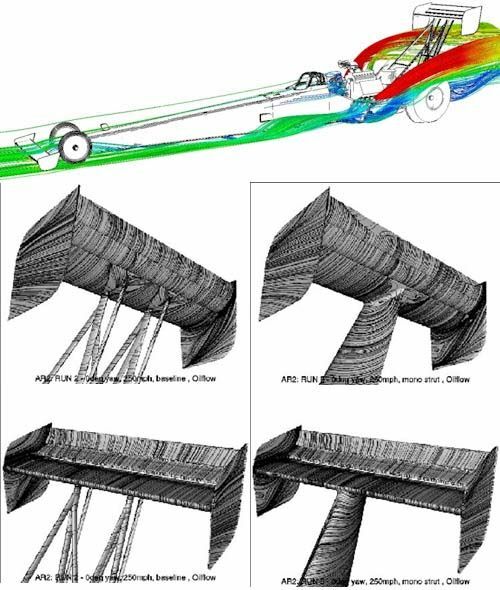 I forgot to ask in my first post, but does anyone know of CFD studies of a Top Fuel dragster? I couldn't find anything via. Google. I'm having a tough time visualizing the flow from the cockpit on back. I am sure that especially on the funny cars there have been some studies. 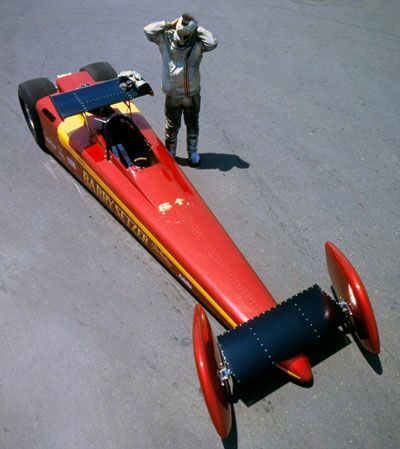 For dragsters I'm not as sure. I know they have studied the rear wings. 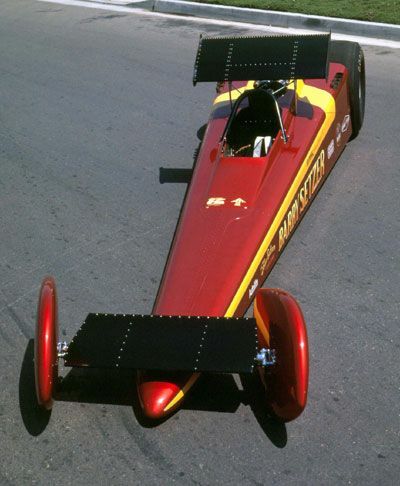 What still grates on me these 38 years on is that back in 1980 the whole bottom side of the dragster was open. Only the sides and top had bodywork. 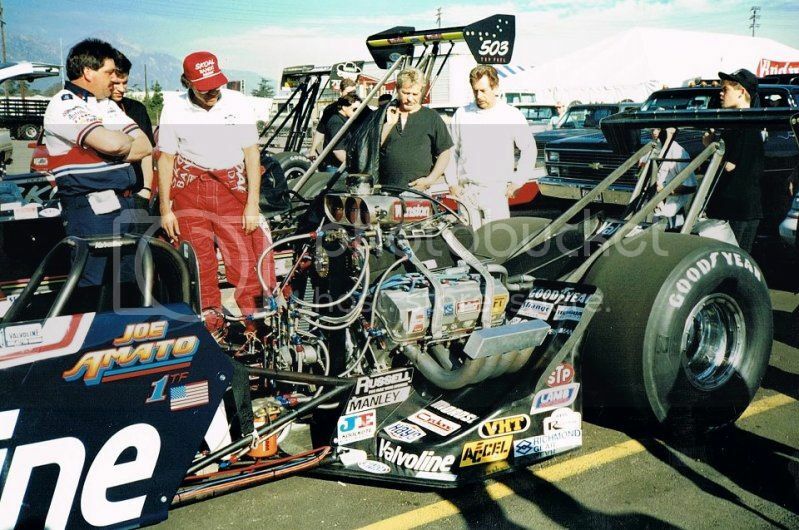 When Al Swindahl built my car I offered that we should incorporate a belly pan and received polite chuckles and was told it wasn't necessary. Then years later they all had belly pans. I'm not real smart but I'm not as dumb as I look. I also wanted to mount video cameras to study frame flex and tires. Maybe if we had had GoPros it would have been better received. Aero is locked in for top fuel, what they have is all they're going to have at this point. Drag is a non-issue regardless, timing and tire slip are where the gains are at these days. This year the NHRA halved the amount of permitted stickem on the track to reduce speeds, it worked well enough when I saw them in July. 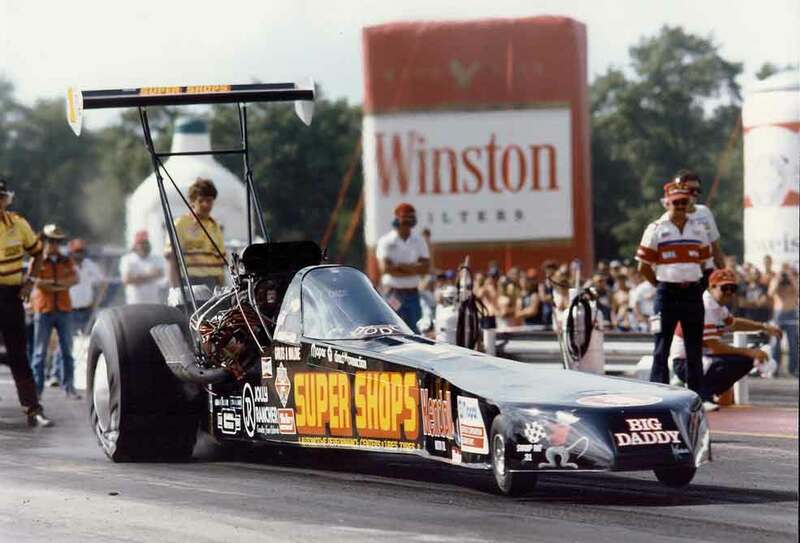 IIRC they have mandated drag figures the cars must meet; I've read somewhere, I believe on this forum, about engineers who had to redesign wings for teams because they were too slippery for the lift they generated. No real argument with anything you had to say. 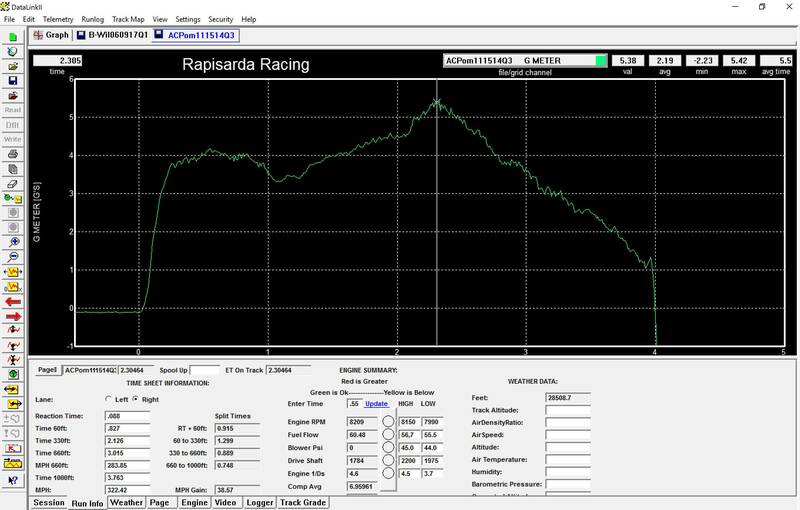 I was chasing aero because, a) I could see things that seemed like they could be 'fixed', and b) I had seen the graph below (One like it anyway) and drew maybe the wrong conclusion about what the retarding forces were above 200 mph (Sorry, graph is acceleration only. I couldn't find a 'speed vs time' or 'speed vs distance' graph.). Given how data / statistics driven the sport is I am sure there is a graph somewhere showing where people got into wheelspin during a run. My completely non data driven, possibly beer fueled impression is that it happens sub 200 mph most of the time. 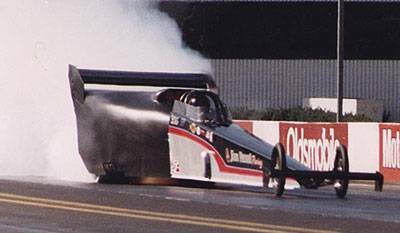 Guess I will chase the 'stop things from exploding' ideas instead of aero, since 'the show' is clearly the priority at the NHRA. They actually show those graphs at every even during Nitro School as they call it. Acceleration peaks around the 400ft mark when they can bring the timing back iirc, tires however are spinning the entire run. The back wheels average something like 10mph faster than the fronts the whole 1000ft, it's necessary for them to prevent wheel hop. tyres will always have a relative speed at the contact point when there is any significant power applied. That is how tyres (made from rubber) work. I didn't read through everything on the site, so maybe it's called out what speed the images represent, which would be important. Still though, that rear wing seems to be up in clean air despite the huge impact of the exhaust. Regarding 'loss of traction', I was referring to a total over-rev situation, where they have to lift to regain control. Sometimes leading to a 'pedal fest' which can be fun to watch but doesn't look fun to do. Matt Hagan managed to get his car three or four feet off the ground earlier this year through a combination of steering and throttle application. Gnar. I guess something like a blown diffuser isn't possible/allowed? 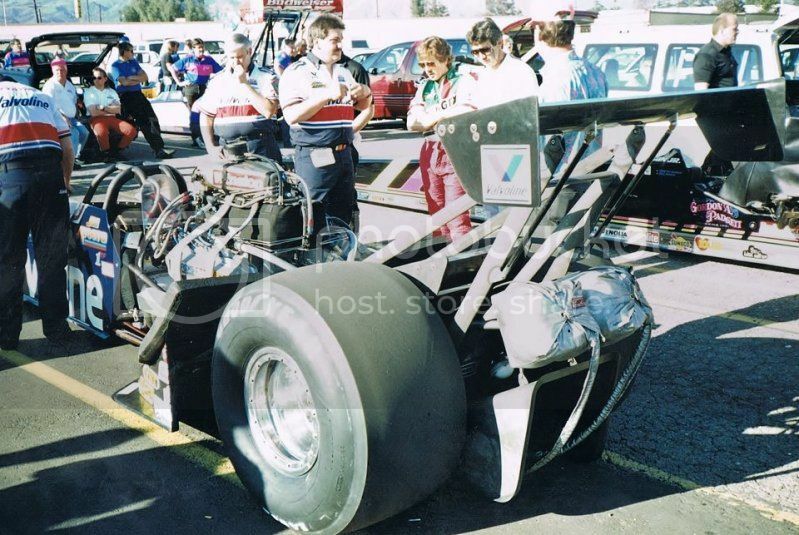 I know, I just found it surprising how much of a difference there was between the front and rear on fuelers, especially given the difference in diameter. OK, some more aero stuff, from the mid eighties, including at least one diffuser for Jolle (Not 'blown', sorry. ), and a full belly pan for Roon. Theres a lot going on around the enginebay aero wise (also litarly). 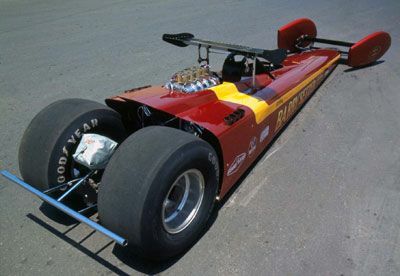 I don’t know why they never gone further over the streamliner concept (Castrol dragster), I think the weight of such body has something to do with it. Also I reckon they had a lot of problems with it which caused a msisfire which eventually caused a body shredding explosion. Anyway to get back to the headers: in a run a dragster sometimes drops a cylinder, the lack of force at that side of the car causes the car want to go to that side (so for example it drops a cylinder (stops firing) at the left bank, the car turns left) makes you think... it’s not only that but it also gives a lot of ‘downforce’ (I know it’s not the right term but you guys understand what it’s doing). 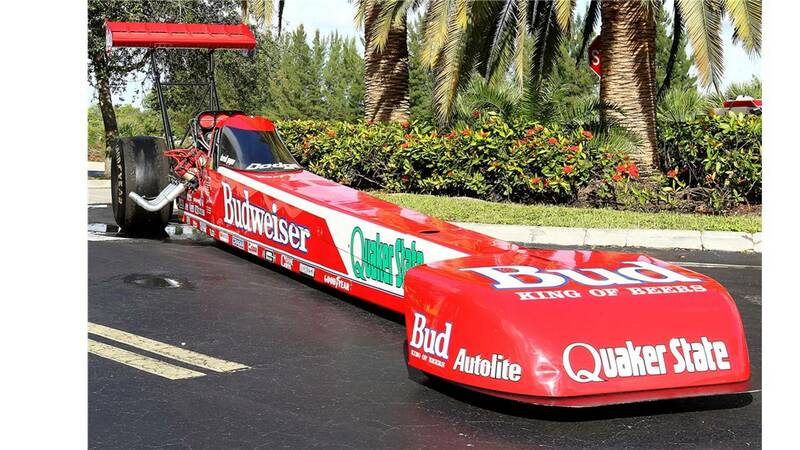 In Funny Cars (the full bodied counterpart of the dragster) they have been experimenting with the header angles for some time now, it gives the drivers a lot of understeer but it also makes them quicker to angle the headers more to the back. 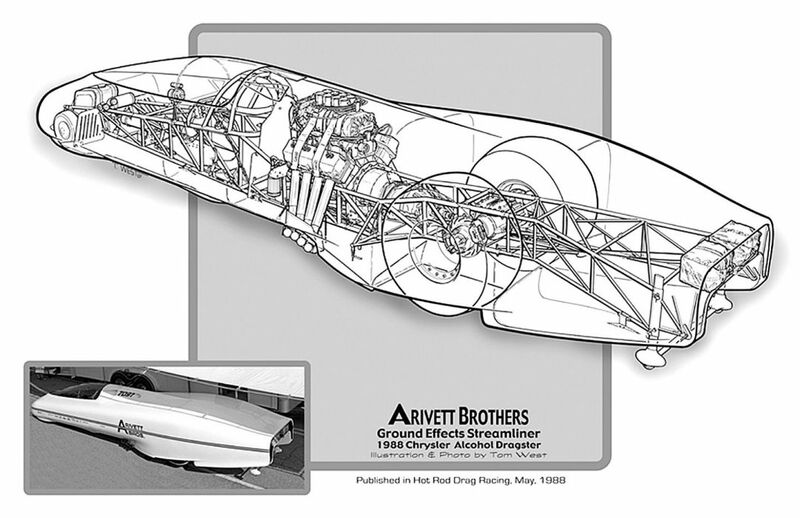 Now back to the rear wing of a dragster, it’s indeed over regulated. You can only run (I think) 3 degrees AoA for example. The dimensions and elements are all regulated. I think the fact that the rear wing is not on top of the rear axle is because when you put it behind it the leverage will also work for you to put even more force on the rear wheels. The cars (I think I already saw a picture of that) are made with a X amount of stiffnes in the chassis which (as far as I know) the less stiff it is the better it is. This also makes the car make an ‘arch’ further down the track. Indeed the tires are always spinning which ‘we’ call blackstriping. It’s a minimum amount but indeed it’s spinning.